Now do the same with the bottle. You should find it much easier to blow out the candle behind the bottle than behind the box. When you blow into the box, the air has to change direction and it will follow the surface until it hits a sharp corner, at which point the flow will tend to separate from the surface of the box and carry on off to the sides. If on the other hand you blow at the bottle, the air will tend to stick to the surface even as the surface curves, this is called the Coanda effect. 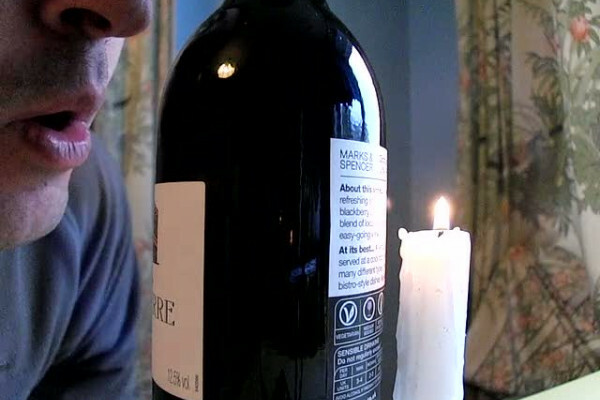 This way the air curves all the way around the bottle, and can blow out the candle. The air is deflected from its original path far less by the bottle than the box which is the reason that cars tend to have very smooth streamlined shapes, which use far less energy to move fast. Of course the behavior of fluids such as air is very complex. Sometimes if you blow ridiculously hard around a squarish object it can blow the candle out. This is probably because you produce so much turbulence (swirling air) that this can blow out the candle.